1890-1897 autograph album that belonged to Katie C. Beyer of Allegheny County, Pennsylvania, possibly at Wexford or Pine. 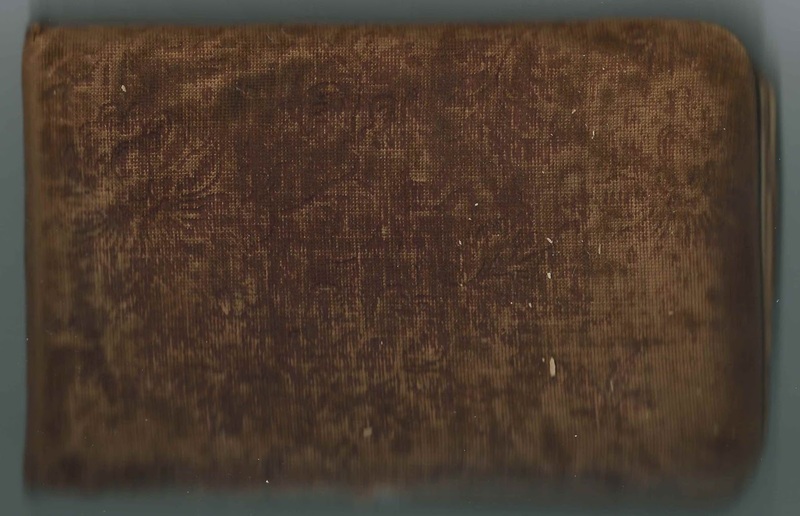 The album, which has puffy red velvet covers, measures approximately 7-3/4" x 4-1/2" and contains the sentiments of 32 of Katie's relatives and friends. An alphabetical surname list and an alphabetical list of the signers, together with any personal information they offered, appear at the end of this post. 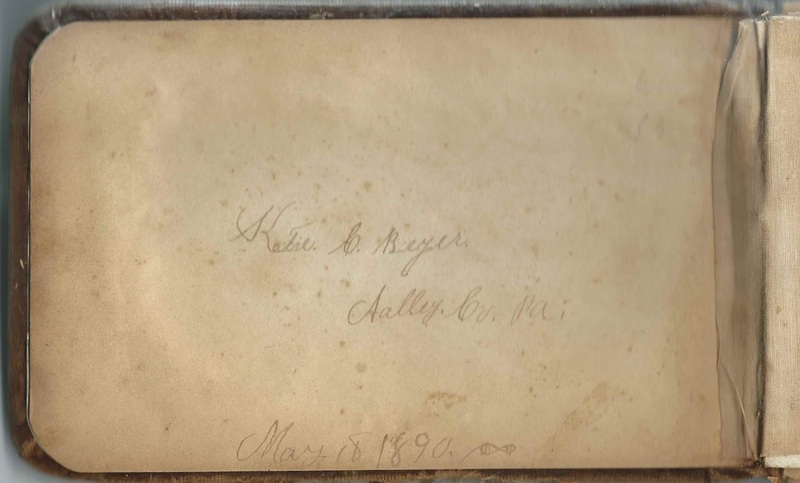 One of the signers, Maggie E. Beyer, who inscribed a page on January 18, 1891, called herself Katie's sister. I don't know if Maggie was a sister or sister-in-law, as I'm not sure if Beyer was Katie's maiden name. 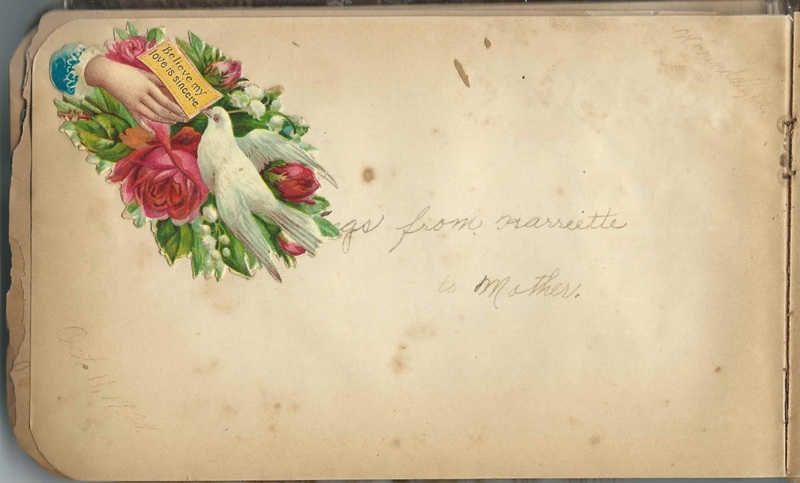 Another signer inscribed a page from Mariette to Mother, which appears to be a page signed later by Katie's daughter Harriette, though I haven't yet found a connection. Several members of the Sasse family inscribed pages in the album. 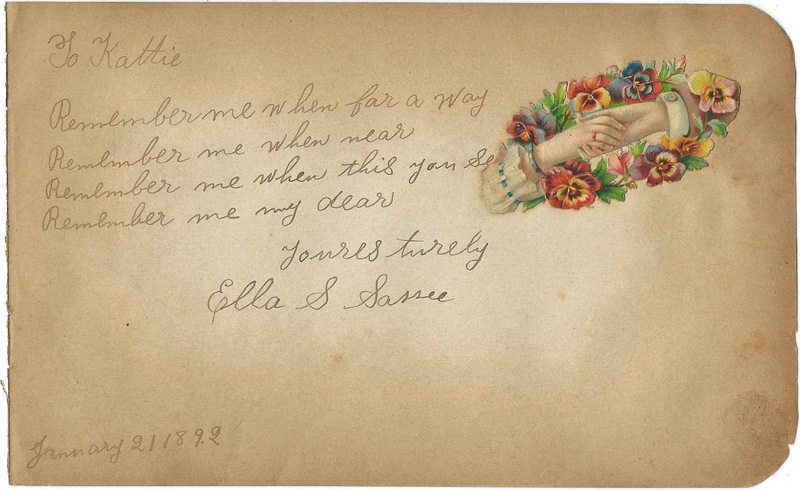 One of them, Ella S. Sasse, signed her page on January 21, 1892. Interestingly, I found that an Ella Sasse married a Christ Beyer on April 22, 1896 in Allegheny County, Pennsylvania. Hopefully a reader with knowledge of the genealogy and history of Allegheny County, Pennsylvania, will leave a comment with information on the Beyer family. 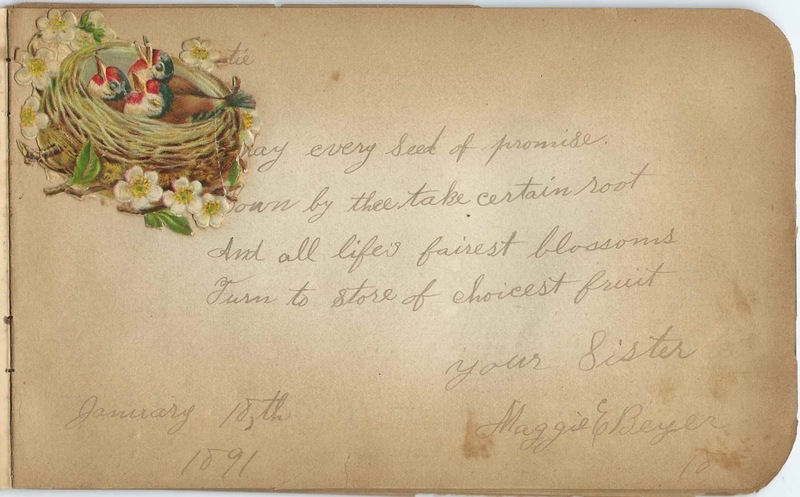 "Greetings from Harriette to Mother"
Maggie E. Beyer, signed on January 18, 1891; "your Sister"
Ella Duncan, signed on November 25, 1891. Interesting sentiment: "Creditors have better memories than debtors." Alice Fogal, signed on November 27, 1891; "your schoolmate". Katie pasted a clipping of Alice's death notice on the page, indicating that she was the widow of William Dean and listing her surviving siblings. 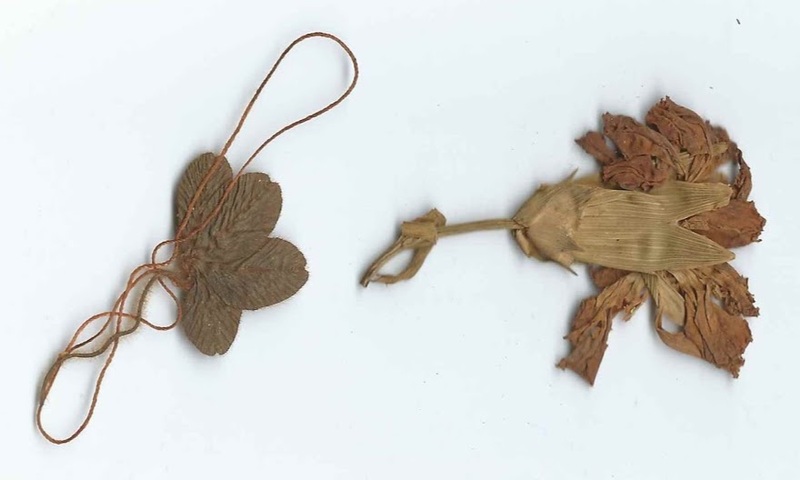 The clipping is undated. Minnie Fedilga Sasse, signed on November 2, 1891; not sure of middle name. Minnie F. Sasse, born about Dec. 1880, daughter of Elijah T. Sasse and Livia A. (Mickley) Sasse. Pious T. Sasse, signed on January 25, 1892. There was a Sasse sibling by the name of Pious Theodore Sasse, but the sentiment appears to indicate the signer is a girl. Rena Soergel, signed on April 23, 1893; "your school Friend"